Although La Monte Young is one of the most important composers of the late twentieth century, he is also one of the most elusive. Generally recognized as the patriarch of the minimalist movement-Brian Eno once called him "the daddy of us all"-he nonetheless remains an enigma within the music world. Early in his career Young eschewed almost completely the conventional musical institutions of publishers, record labels, and venues, in order to create compositionscompletely unfettered by commercial concerns. At the same time, however, he exercised profound influence on such varied figures as Terry Riley, Cornelius Cardew, Andy Warhol, Yoko Ono, David Lang, Velvet Underground, and entire branches of electronica and drone music. For half a century he and hispartner and collaborator, Marian Zazeela, have worked in near-seclusion in their Tribeca loft, creating works that explore the furthest extremes of conceptual audacity, technical sophistication, acoustical complexity, and overt spirituality. Because Young gives interviews only rarely, and almost never grants access to his extensive archives, his importance as a composer has heretofore not been matched by a commensurate amount of scholarly scrutiny. 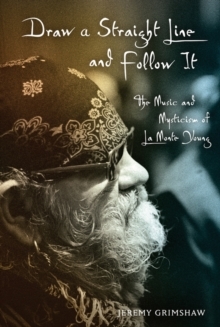 Draw A Straight Line and Follow It: TheMusic and Mysticism of La Monte Young stands as the first monograph to examine Young's life and work in detail. The book is a culmination of a decade of research, during which the author gained rare access to the composer and his archives. Though loosely structured upon the chronology of the composer'scareer, the book takes a multi-disciplinary approach that combines biography, musicology, ethnomusicology, and music analysis, and illuminates such seemingly disparate aspects of Young's work as integral serialism and indeterminacy, Mormon esoterica and Vedic mysticism, and psychedelia and psychoacoustics. The book is a long-awaited, in-depth look at one of America's most fascinating musical figures.